Want to be a PLAYWRIGHT? 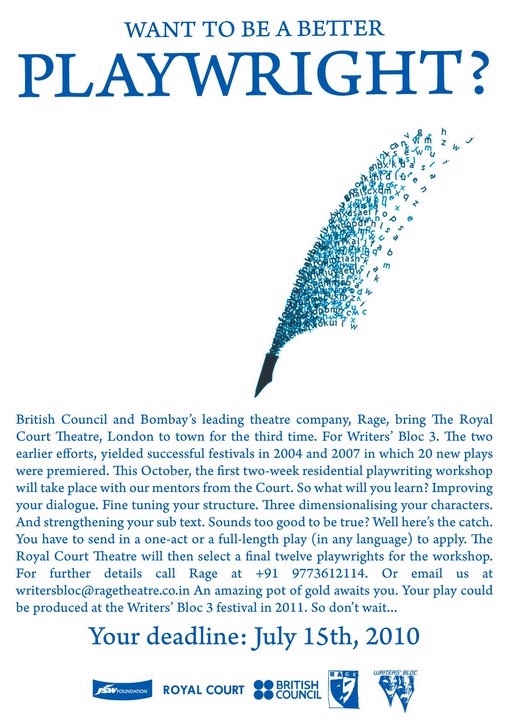 Posted in Connections through Culture and tagged British Council India, call fro applications, Connections through Culture, grants scheme, playwright, rage productions, Royal Court Theatre, writer's bloc 2, writers workshop on June 7, 2010 by British Council India. British Council (as part of Connections through Culture programme) and Rage bring The Royal Court Theatre, London to town for the third time. For Writers’ Bloc 3. An amazing pot of gold awaites you. Send in a one-act or a full-length play (in any language) and you could be one of the final 12 playwrights who get a chance to participate in a two week residential playwright workshop by the mentors of Royal Court Theatre.